What type of clothes match your lifestyle NOW vs five years ago? How do you need your wardrobe to function first thing in the morning? What clothes/ outfits do you wear that everyone compliments you on? 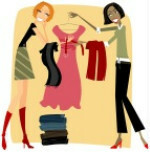 Where will you donate or sell the items that don’t make you look absolutely positively fabulous? Ok, now you’re ready to open the door! Take each item out and if you know instantly it doesn’t belong in your life anymore, send it packing! If you still like and wear the item, work out what it is and group like with like, colour with colour – and winter items together. The aim is to be able to see if you have 15 black short sleeve turtle neck tops, so you can pick the best ones to stay. When the going gets tough - remember to focus on your chosen charity to make the “donate” decision easier! Once you know what stays you’ve got a better idea of how much stuff you really have and what sort of storage you need. At this point the aim is to look at the way you store your clothes to get better access to them as it is said we only wear 20% of our clothes 80% of the time. Check out our You Tube video on clever storage solutions for wardrobes to find out the organising tools we recommend to all our clients. Use a system to monitor the items you aren’t ready to let go! One of the simplest is to hang all of your coat hangers facing one way (e.g. backwards). As you return an item put the hanger facing the opposite way (e.g. forwards). You’ll be able to see quickly which items are taking up precious real estate in your wardrobe because the items you don’t use will have their hangers facing backwards. Set some rules around the inflow of clothes. For every new item you bring in one thing has got to go! If you want to challenge yourself try one in, FIVE out.